The old coaching village of West Wycombe is an excellent centre for splendid walks and there are plenty of places where the ravenous rambler can get some refreshments. I had lunch at the West Wycome garden centre this week. There is a small indoor eating area and then some seats outside with a nice vista. It was rather a strange ordering process – you have to go to the till in the main shop to order and they only have one menu! I chose a quiche with salad for £4.50 and a pot of refreshing tea and settled down in the shade of the indoors. The salad was very good although no dressing and the quiche was quite small although for the price these days I suppose it was reasonable value and filled a small place inside. The tea was refreshing but the service seemed unfriendly on a day when there was hardly anyone around. 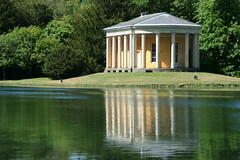 I then went for a short but splendid walk around the National Trust property of West Wycombe Park. The views at this time of year were splendid with trees overhanding the rivers. I walked through the deep cow parsley on a grassy path that passed follies and bridges over a meandering brook. This is not a wild place but a carefully manufactured parkland in the manor of Capability Brown. It is beautiful and an escape from the world outside. A swan with six cygnets swam past and I spotted a kestrel in the trees and several low flying kites. The view of the house from the other side of the lake is beautiful and I came away feeling quite refreshed by the experience.